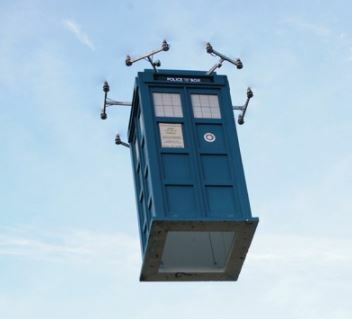 Check out this life-size Doctor Who flying TARDIS, build, flown and filmed by Flyonix.com to celebrate the show’s 50th anniversary. (A Tardis is a “Time and Relative Dimension In Space” time machine and spacecraft piloted by the show’s hero.) Videotaped on its maiden, transition to forward flight is interesting to say the least, but this creative flyer gets two thumbs up from us. Well done; we think the Doctor himself would approve! Columbus didn’t know if he could cross the ocean till he tried it…… GOOD FOR YoU?.”.